Checker is an interesting game and easy to play for all ages. Playing checker game has as same fun as play chess game. Both of the game use similar board with 64 squares, 32 black squares and 32 white squares. The different is in their pieces. A Set of Checkers consists of 24 Checker pieces, 12 pieces are dark and 12 pieces are light. 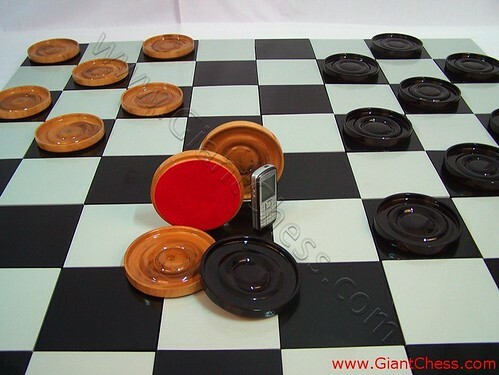 Checker pieces are round and not too high, very easy to move and save even they are in giant size. The most obvious difference between chess and checker games is the differing nature of the pieces and their position at the start of the game. All of the Checker pieces are placed on black squares and all of their moves are of the same type, diagonally forward, until one of the Checker pieces gets crowned as King, then he has the ability to move and capture differently, forwards or backwards.